IAS Inc. is a full systems integrator that develops automation systems to bring cutting edge technology to life. They started with a wide customer base in industries such as food & beverage, automotive, and general manufacturing, giving them a diverse wealth of knowledge and a holistic engineering approach under one roof. Today, IAS provides services in robotics, vision, motion control, and SCADA systems. IAS first encountered Visual Components in 2010 while searching for ways to speed up their proposal response process. “We had been considering 3D simulation software because we loved the idea of bringing the concepting and design phases earlier into our sales flow.” said Kyle Weise, Lead Marketer for IAS. Kyle and his team were impressed by the ability of Visual Components to create high quality 2D and 3D renderings and simulations, and saw the potential for improving both their engineering workflow and marketing. After our first demo at our facility we knew that we wanted to move forward with the software as part of what we do. We have been using it ever since. IAS started using Visual Components as a tool to speed up their proposal response process. 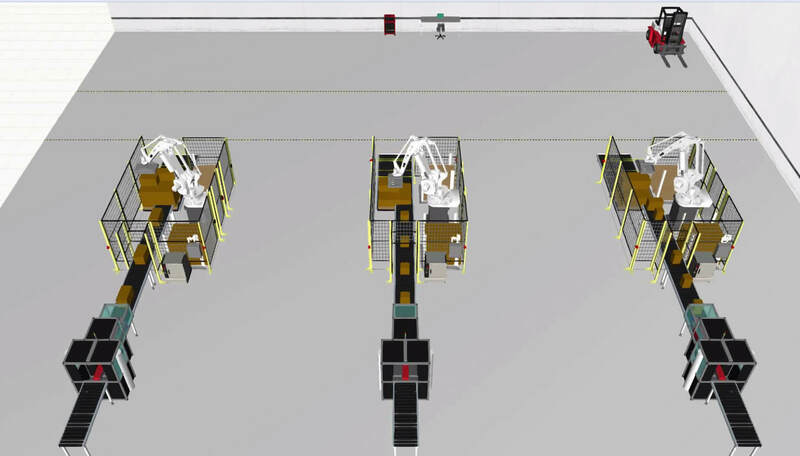 As they continued to use Visual Components, Kyle and his team found that being able to present prospects with 3D simulations of new production concepts improved their confidence in moving forward with new projects. He recalled one recent case where this was critical to getting the project approved. 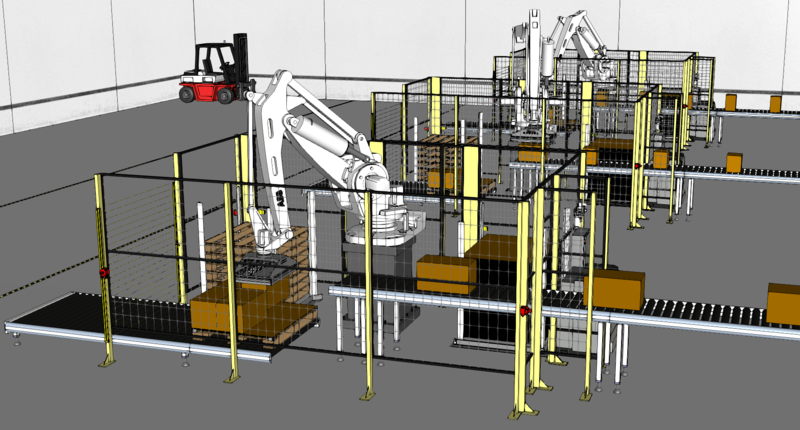 “We were called in to a customer’s facility to look at a single robot pick and place operation,” Kyle said about the project. The customer was intrigued, but wanted to know that this more complex concept was feasible, and that IAS could deliver. Kyle and his team worked with the customer to design and evaluate several different configurations for the new station, creating 3D simulations for each concept. The approach worked. Many meetings and revisional 3D PDFs later, IAS was notified that they won the project. Today, IAS uses Visual Components heavily in the sales, concepting, and initial engineering phases of new projects. Getting a layout and budget together quickly gives both parties a solid point of reference to build upon as the sales cycle continues and helps maintain that knowledge when the project begins the more in-depth engineering phase. IAS has also taken comfort in knowing that the solutions they’re designing with Visual Components will work as planned, giving them more confidence in their ability to deliver on schedule and budget. Stress-testing specifications early in the process has been a huge benefit to both IAS and its customers. “Not only does it help us avoid costly repositioning or rework on a cell, but it assures us that the robot we have specified truly is the best one for the job,” said Kyle. This is especially helpful for projects that involve robots with crowded work envelopes. Kyle recalled one especially tricky project that included a robot that took unique paths working in and around machinery. Not only does it help us avoid costly repositioning or rework on a cell, but it assures us that the robot we have specified truly is the best one for the job. In the current automation environment, no piece of equipment is an island, and the more suppliers that are involved in automation projects, the more difficult they become. It’s critical that system integrators are in sync with customers and each other to get the best outcomes. With Visual Component’s extensive library of industrial robots, IAS engineers have the capability of simulating almost any major robot brand on the market, giving them flexibility to select the best robots for each project. We love having such an extensive library of robots at our finger tips to be able to accommodate whatever the customer might be looking for. The ability to import a large range of CAD formats is also critical for compatibility, especially since you never know what programs your customers and suppliers use. Even for your internal design and engineering teams, you don’t want to force them to use a different CAD program in order to get the benefit of using manufacturing simulation. It is great being able to seamlessly integrate with our mechanical engineering and design departments through CAD import and export. This allows us to use the best talents on each end to work more efficiently and effectively. Visual Components continues to play a central role as IAS expands its product offerings and capabilities. The software has been particularly important for promoting one of the company’s most innovative new projects. 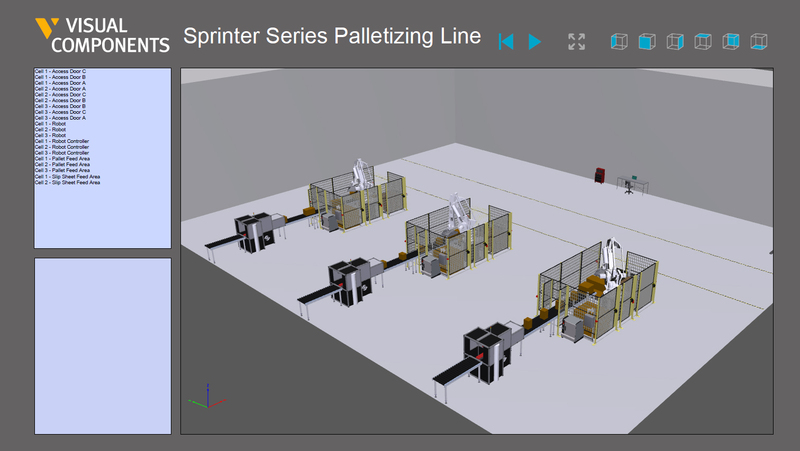 For companies considering whether to adopt the Sprinter Series, it is essential to visualize how they will work for specific operations. To that end, 2D and 3D renderings, along with simulations from Visual Components have proven invaluable. We’ve received great feedback on being able to simply pull out a tablet or laptop and talk through the unique value in a Sprinter cell.